"Fantastic shows, breathtaking performances, amazing amphitheatres with chariot racing, gladiators and lions, jousting competitions, superb falconry displays. Professional organization without any queuing - the whole experience was unforgettable." 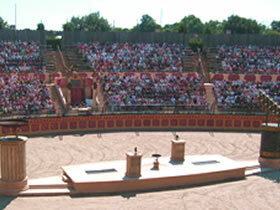 The Puy-du-Fou day show, is a famous medieval theme park attraction (famous throughout France). The huge park includes an impressive large Roman amphitheatre with chariots and fighting gladiators, jousting knights on horseback, falconry and much more. You will need to book the evening show in advance. However, there is no need to book the day show - just turn up and have a wonderful day out. The evening show is one of the best sound-and-light shows in Europe, and uses sophisticated special effects to tell the history of the Vendée. You will need to book the evening show in advance. By Car: A87 motorway, exit No. 28: Les Herbiers.